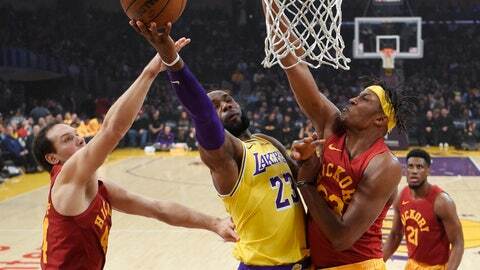 LOS ANGELES (AP) — LeBron James‘ team was in danger of blowing a close game Thursday night until he seized control and carried his teammates to victory. The Indiana Pacers? They’ve seen this plenty of times over the years, and they’re still not crazy about it. “We’ve got the best player ever to put on a jersey, so that helps us out a lot,” Hart said. James added nine rebounds and seven assists in his first game since scoring a season-low 14 points in the Lakers’ loss at Denver. The Lakers are just 21 games into James’ first season, and he is still adjusting his game to his new team’s needs. He’s playing the fewest minutes per game in his career, and he is learning to delegate responsibility for ball-handling and big shots. Indiana trimmed Los Angeles’ lead to 89-88 on Domantas Sabonis‘ jumper with 4:59 left, but James replied with a 3-pointer and a three-point play on consecutive possessions to start a 10-0 Lakers run. He added a 22-foot jumper with 2:21 to play and a 19-footer on the next possession, calmly sealing it. James’ Cleveland Cavaliers eliminated the Pacers from the playoffs in each of the past two seasons, going to seven games in the opening round last year. James’ Miami Heat also sent Indiana home in three consecutive postseasons from 2012-14. Pacers: Bojan Bogdanovic had 14 points for the Pacers, and Thaddeus Young added 11. … Indiana fell short of its eighth road victory already this season. Only Toronto and Utah have more. Lakers: Lonzo Ball had two points and eight rebounds in 34 minutes while playing through an ankle injury. Ball sprained his ankle in LA’s loss at Denver on Tuesday, but made good on his vow to play through it. … Lance Stephenson played five scoreless minutes. He played in all 82 games last season for the Pacers in his second stint with the club, averaging 9.2 points. … Kentavious Caldwell-Pope hit three 3-pointers and scored 11 points. The Lakers scored the game’s first 13 points and jumped to a 23-point lead while rolling to a 38-point first quarter. Yet LA led only 56-50 at halftime after Sabonis scored 14 during the Pacers’ 35-point second quarter.